Happy Easter! I probably should have posted this earlier, but I wanted to wait until Easter to make these adorable cupcakes so they were nice and fresh for the Easter party we just came back from. 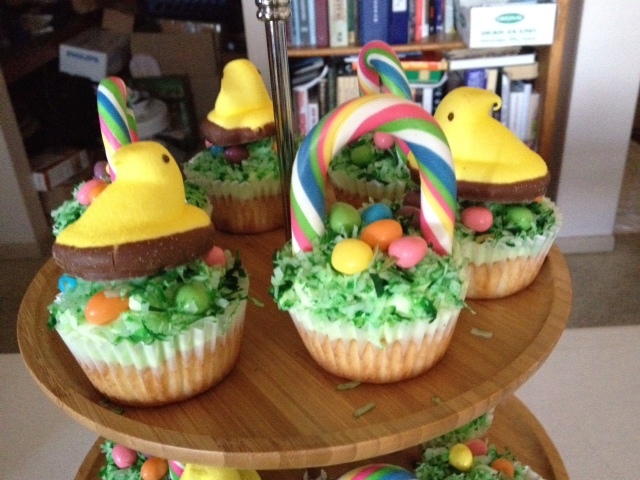 I kept trying to figure out what Easter-themed cupcakes I was going to make and I just couldn’t think of anything I liked. Until… the Easter bunny visited! Of course, the Easter bunny dropped off my basket at my mom’s house in D.C. He must have lost my change of address form. No worries though, my mom forwarded my husband and me our Easter baskets 😉 My wonderful Easter basket contained the answer to my question: a super cute Easter basket cupcake kit! I thought green coconut would look great as grass and of course jelly beans as Easter eggs. 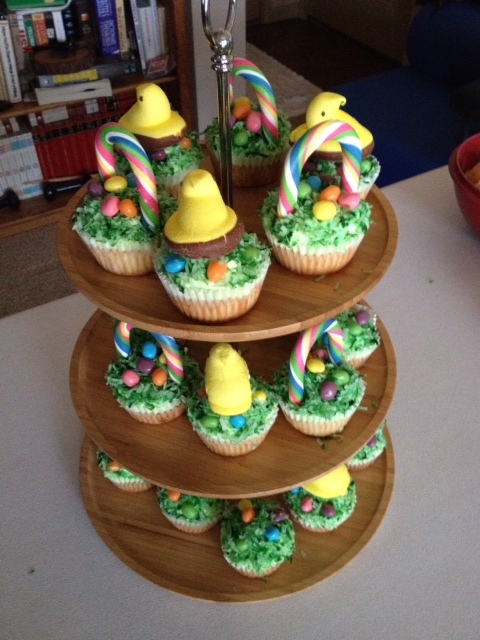 The Easter Bunny also delivered some peeps, so I decided to have a few looks to the cupcakes. Some will be Easter baskets filled with grass and eggs and others will have peeps sitting on eggs on a bed of grass. Yay! Off to work. Start with whatever flavor cupcakes you want to make. I made coconut vanilla cupcakes. Top them with your favorite icing mixed with a touch of green food coloring. I made a cream cheese whipped cream frosting with a touch of coconut and just enough food coloring to make a soft green. For the grass, very lightly toast some coconut. Just enough to bring out the flavor. Then, put your coconut into a large ziplock bag and add several drops of green dye. Close the bag and shake. Continue to mix and add green food coloring until you’re happy with the result. Top your frosting with a generous portion of green coconut. Add assorted jelly beans to look like colored eggs sitting on the grass. If you want nesting ducks, stick a toothpick into the bottom of a peep and prop it right on top of the eggs (making sure the eggs peek out from underneath). Make sure to warn your guests to remove the toothpick. The peeps pictured are chocolate-dipped peeps. I also used some regular peeps. Or, if you can get the super cute Easter basket kit (mine was Wilton), add your U-shaped candies. Push them in enough to stay, but not so much you smash the cupcake. Then you have a basket of eggs! If you can’t find the basket kit, try using Twizzlers instead! I made some baskets, some with peeps, and some with only grass and eggs. They were a big hit! Happy Easter!